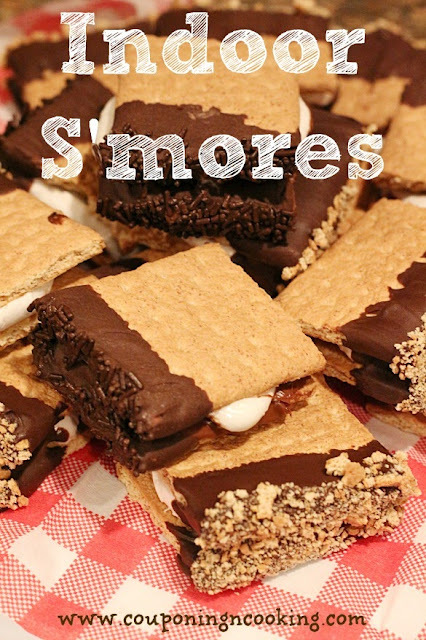 Tobins' Tastes: Indoor S'mores / I want s'more summer! How is summer almost over? I don't know about you but I am not ready to go back to work. I know I shouldn't complain, I have the whole summer off and blah, blah. blah. But I want more. I want S'more Summer! 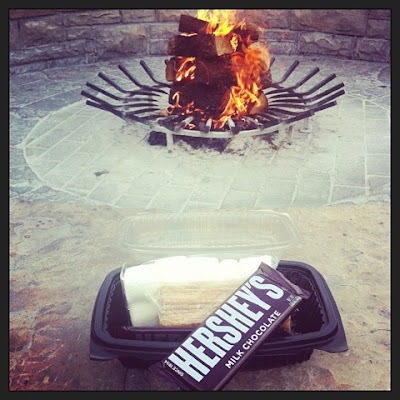 On our Colorado vacation our hotel in Beaver Creek gave out complimentary s'mores kits to guests and every night they had a huge bonfire complete with roasting sticks and everyone went out on the patio and made s'mores. S'mores are the quintessential summer treat. What says summer more than sitting around a fire with melty marshmallows, sticky fingers, and an excuse to slam large amounts of chocolate? So in honor of s'mores and my desire to extend summer I am bringing you two s'more recipes this week plus a HUGE S'more treat round up on Friday with tons of amazing S'more recipes from some of my favorite bloggers. So first up in S'more of Summer week, are the South Floridians' solution to to rainy afternoons and temperatures way too hot to light a fire. Indoor S'mores: no fire, no sticks, minimal mess. They seem way too simple to be good, but they are amazing. When I brought them to a cookout at my sister's everyone was a little skeptical about them. They were all like, "Let's split one, oh I only want a bite". And then they tried them and they all wanted their own. Or two of their own. Maybe my mom even had three of her own. And I couldn't even judge them because they are that good. These are really good right out of the oven but they are also amazing once they have cooled. I stored them at room temperature in an air tight container and they stayed fresh (and delicious) for three full days even with Florida humidity. And I didn't even have to light a fire to make them which makes my pyromaniac, firefighter husband a little disappointed but once he tasted them he got over. 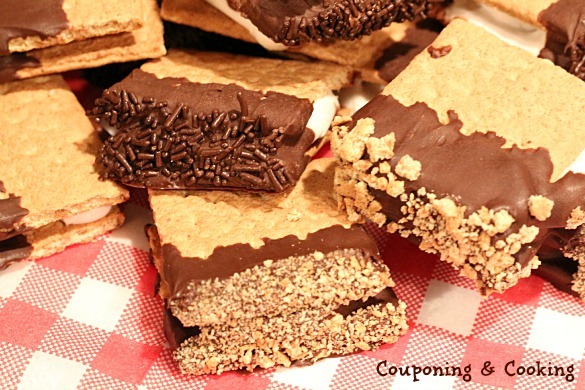 So fire up your oven and try s'more of summer today! 1.) Break each graham cracker in half. Place 12 halves down on a lined baking sheet. 2.) Put a jumbo marshmallow on each cracker half. 3.) With the oven on broil, place the baking sheet under the broiler for 3-4 minutes until marshmallows start to melt and brown. 4.) While they are in the oven, break the Hershey's bar in to two square pieces. 5.) 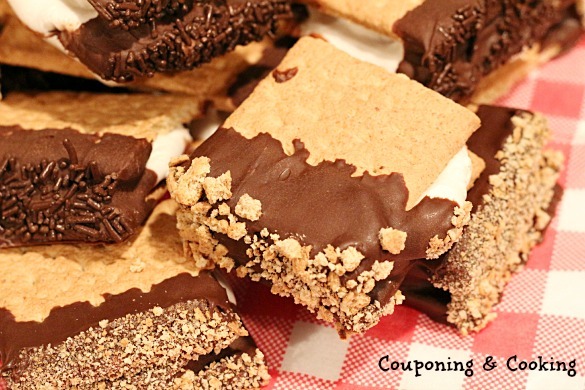 As soon as the halves and marshmallows come out of the oven place two chocolate squares and the second half of the graham cracker on top and press them together. 6.) Refrigerate the sandwiches to help them set. 7.) Melt the Wilton pieces however you prefer and dip the set s'mores half way into the melted chocolate and then roll them in either sprinkles or graham cracker crumbs. 8.) Place back on the lined baking sheet and refrigerate until set.